The apostle Paul is the primary author of the book of Colossians however, Timothy is also given some credit, (Colossians 1:1). 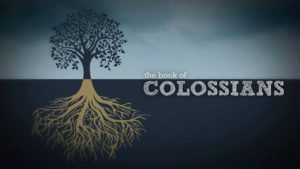 The Book of Colossians was likely written between A.D. 58-62, and the first half of the book is a theological treatise that includes one of the most profound presentations of Christology anywhere in the New Testament. The second half is a mini-ethics course, addressing every area of Christian life. Paul progresses from the individual life to the home and family, from work to the way we should treat others. The theme of this book is the Lordship of Jesus Christ and His sufficiency in meeting our needs in every area. 15th January 2017. Colossians 1:1-12 - Prayer. 22nd January 2017. Jesus - Colossians 1:13-23. 29th January 2017. The Gospel - Colossians 1:21-23. 12th February 2017. God's Mystery - Colossians 1:24-2:8. Download: God's Mystery - Colossians 1:24-2:8. 19th February 2017. Alive in Christ - Colossians 2:9-15. 26th February 2017. Freedom From Human Rules - Colossians 2:16-23. 5th March 2017. Who we Are in Jesus. Colossians 3:1-17. 12th March 2017. Family Life - Colossians 3:18-4:1. 19th March 2017. Being Prepared - Colossians 4:2-6. 26th March 2017. Relationships. Colossians 4:7-18.